We've looked at the content of your presentation – now it's time to focus on how to deliver it. Try the activity to read four suggestions for effective presentation delivery. Are they good or bad suggestions? Sort the suggestions about delivering your presentation – are they good or bad? Is movement important when you're presenting? Who should you look at during your presentation? Is signposting important to help your audience follow your presentation? Is it a good idea to let the audience ask questions about your presentation? That's right! This is bad advice. In many academic contexts, it’s normal to move around a little, and to gesture with your hands while you’re speaking. It would seem very strange if you stayed very still throughout your presentation! Sorry, that's wrong. Think about your movement when you're presenting. That's right! This is bad advice. Try to make eye contact with all the members of your audience, not just your teacher or supervisor. Sorry, that's wrong. Think about who you make eye contact with during your presentation. That's right! This is good advice. Use signpost language to help your audience to follow the structure of your presentation. You can use phrases like, "Now I’d like to turn to…", or "This brings me to my next point, which is…"
Sorry, that's wrong. Signposting is important during a presentation. That's right! This is good advice. At the beginning of the presentation, the speaker normally says something like, "If you have any questions, I’d be happy to answer them at the end." Sorry, that's wrong. Your audience may want to ask you something about the content of your presentation. Let's review what we've learned so far about making your project into a presentation. Turning an academic project into a presentation can be a challenge, but think about it as an opportunity to show your work in a different way. You'll need to think about the structure of your presentation and preparing professional slides, as well as pronunciation of key words and phrases. Your presentation should be logical and follow the same structure as your project – don't change things too much! Memorising your presentation is a bad idea! You run the risk of sounding boring and may have problems if you forget any words in the presentation. Make a list of key words in your presentation – practise pronouncing these correctly so that the audience can follow what you're saying. Keep your slides clear and simple – this will help your audience follow the topic of your presentation. Pay attention to the size and colour of text on your presentation slides – you need to make sure it is easy to read. 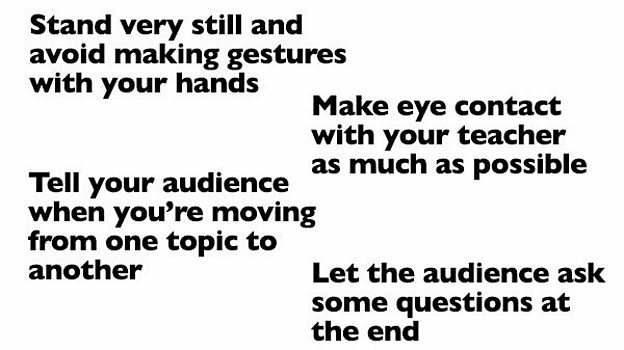 Think about how you're going to present your topic – movement, eye contact, managing the audience and dealing with questions are all important. That's it for now! Next time we'll be looking at developing your writing technique for exams. In the meantime, click on Downloads to get a free pdf worksheet with more activities on: choosing presentation words for pronunciation practice; learning some useful phrases for your presentations and identifying common mistakes that you should try to avoid.